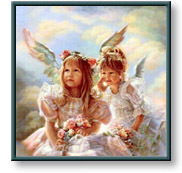 Two angelic girls share heavenly secrets in Heavenly Whispers. Heavenly Whispers copyright© 1998 by Sandra Kuck is prohibited from being copied. All applicable copyright© laws apply and are reserved by artist Sandra Kuck.